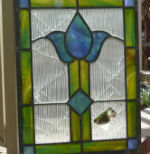 Stained Glass Repair We can repair almost any type and age of stained glass. We will do our very best to match the existing glass. Repairs are priced individually. Please call us to discuss. We have over 15 years of experience in designing, constructing and installing stained glass art for residential, commercial and place of worship.